CRAZY COOL GROOVY!!! : TIGER WOODS vs PHIL MICKELSON For $10 MILLION In LAS VEGAS During THANKSGIVING WEEKEND 2018!!! TIGER WOODS vs PHIL MICKELSON For $10 MILLION In LAS VEGAS During THANKSGIVING WEEKEND 2018!!! 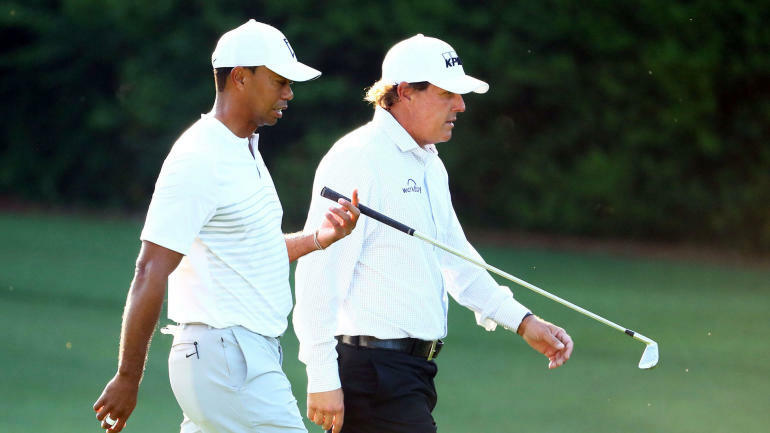 As revealed in early July, TIGER WOODS and PHIL MICKELSON have agreed to play a round of golf one-on-one for what has been reported as a $10 million winner-take-all purse!!! CBS SPORTS: GOLF reports earlier today, ESPN: GET UP Host MIKE GREENBERG revealed the match will go down THANKSGIVING WEEKEND 2018 at SHADOW CREEK GOLF COURSE in LAS VEGAS. Woods, 42, has thrilled golf fans in his return to action this season, recently placing T6 at the 2018 Open Championship, his first top 10 at a major since 2013. He has won the WGC-Bridgestone Invitational eight times, so all eyes will be on Woods this week to compete against a loaded field. Mickelson, 48, won the WGC-Mexico Championship in March, marking his first PGA Tour win in five years. A prestigious U.S. Open championship and the career grand slam still elude Lefty, who is not showing any signs of slowing down the amount of tournaments he plays each year. The two star golfers have had a contentious relationship during their careers, though they have been brought together recently due to a variety of factors including on-course struggles and appearances representing the United States at the Ryder Cup. Mickelson is expected to play in his 12th consecutive Ryder Cup this year, while Woods has already been named a vice captain and hopes to receive an at-large selection from captain Jim Furyk. GREENY and the GET UP CREW chop it up and break it down.